Premier club manufacturer Miura Golf announced the introduction of its newest line of handmade forged irons: the CB-301. Designed and hand-forged in Miura’s Himeji, Japan factory, the CB-301 is the longest forged cavity back iron Miura has ever produced. It is the first fully forged Miura cavity back since the PP9003 in 2011. 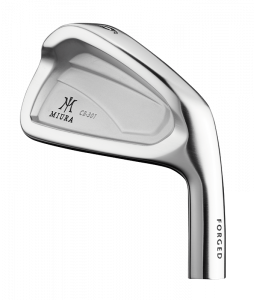 The CB-301 is the most recent advance in Miura’s masterful, ever-evolving approach to club design. It is constructed to optimize performance, with the feel and playability of a player’s iron but the forgiveness and distance to improve golfers of all levels. The CB-301 maintains Miura’s meticulous attention to quality, along with the legendary craftsmanship Miura clubs have long been known for. World-renowned craftsman, Katsuhiro Miura began hand-crafting and grinding irons in 1957 and has created one of the most-respected brands in the golf industry. Miura's endless quest for the perfect club has brought to the world more than 10 product series, a number that grows as the next generation of the Miura family – led by sons Shinei and Yoshitaka – continue their meticulous refinement and evolution of product lines. Each club is individually handcrafted and will never be mass produced, as generations of steel-making skill and passion brings to us the world's-finest golf clubs.